Stitching together devastating moments in communal Jewish history- the Mumbai terrorist attack, Hannah Senesh’s trial, and a deadly Brooklyn fire- as well as the complicated nature of individual psychological struggles, Nehorai’s exhibition of textured canvases, vibrant colors, and etched in lines laces hope throughout. An accomplished writer, Nehorai combines her affinity for the powerful word with her vivid work, using poetic meditations to accompany each one. Despite the battles without and the battles within, the belief that much beauty and purpose abounds are reassuring words for our turbulent times. Rivka Nehorai’s solo show is a moving testament to this philosophy. 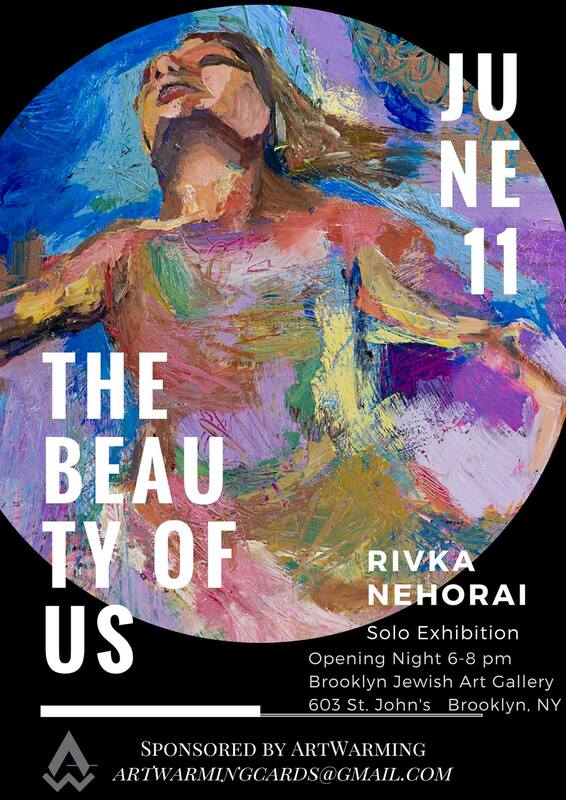 Opening night of “The Beauty of Us” is Sunday June 11, 6-8 p.m.
Brooklyn Jewish Art Gallery is located @ Congregation Kol Israel. Stay until 8:30-11:30 p.m. and join He-Bar-Ia; a pop up bar inside the BJAG space with experimental sound and gourmet grilled cheese, sponsored by Hevria. $10 entrance fee. Rivka Nehorai grew up in Chicago. She studied painting at Rutgers University’s Mason Gross School of the Arts. She divides her time between taking care of her three little ladies, live painting exhibitions, and expanding her studio practice. Rivka is the founder of ArtWarming Cards; a subscription service that delivers blank cards featuring different contemporary artists every month, with creative writing prompts to bring back the lost art of letter writing to loved ones. Find out more here.